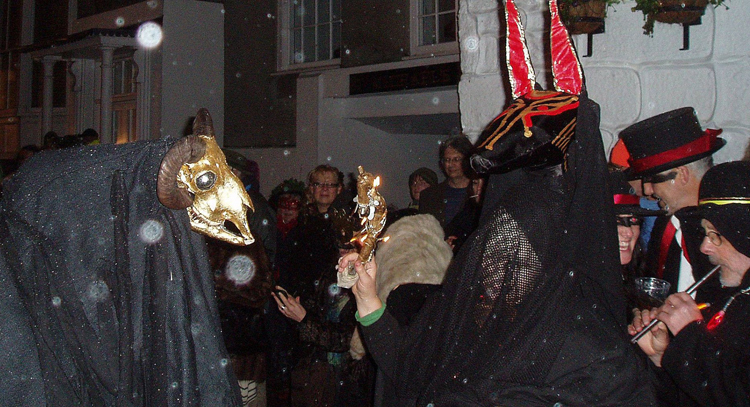 A keen participant in Penzance’s traditional Guize (pronounced ‘geeze’) customs, I am proud to be a member of The ‘Gyptians; one of the town’s Guise Guilds, and to perform as the ‘rider’ of Kasek Nos – Penzance’s Montol Beast, appearing each year at the culmination of Montol – the town’s hugely popular midwinter festival. 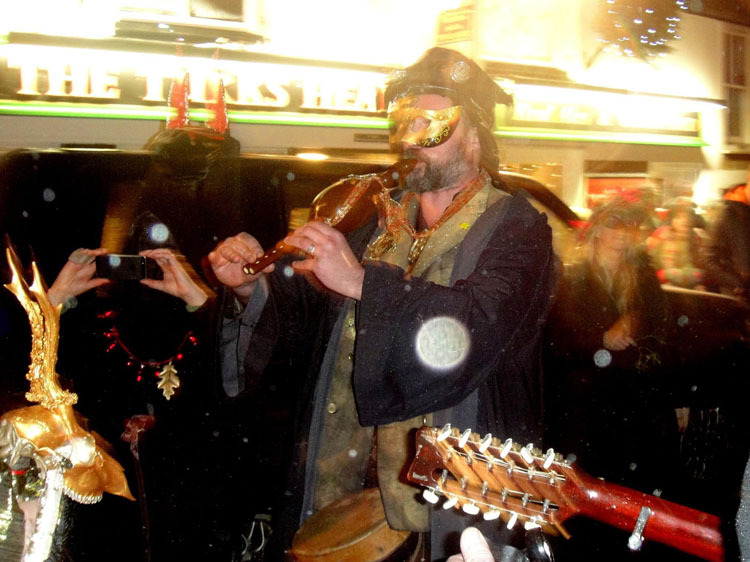 Guize Dancing (also referred to as ‘Geese’ or ‘Goosey’ Dancing) is a Cornish tradition encountered through the winter months, being at its most active around midwinter and the Christmas period. 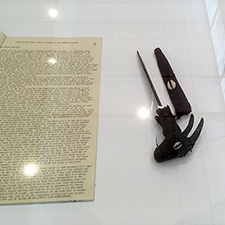 Central to Guizing is disguise – to the extent that a performer’s visual identity is completely concealed. This is traditionally achieved via the use of masks or veils of black lace decorated with sequins or buttons. 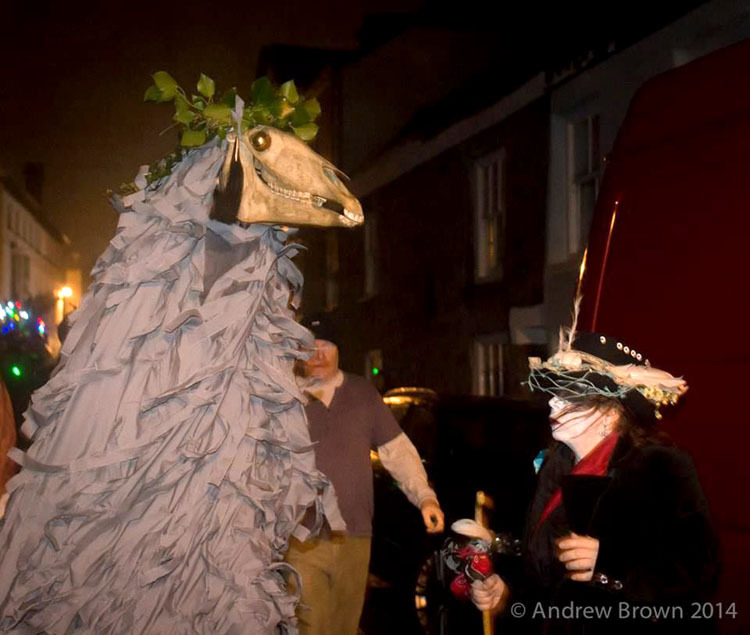 ‘Guize Beasts’ are another traditional and perhaps the most striking form of complete disguise. Such beasts might be formed by the performer, or ‘rider’, being concealed by an animal skull, such as that of a horse or bull, or a headdress of horns or antlers, and the body hidden by hides or fabric. 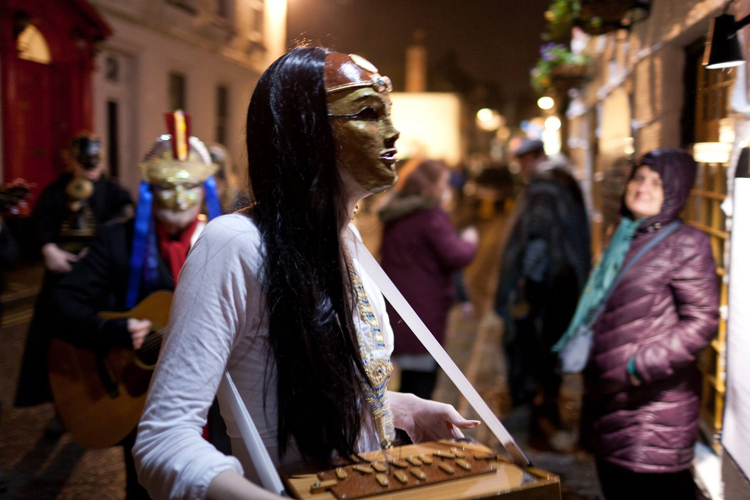 The ‘Gyptians, more formally known as The Glorious Company of the Egyptian House, and also known as The Tinkerlers Shop, are a revival and reinvention of a Guize group dating from the 1830s which went by the latter name. 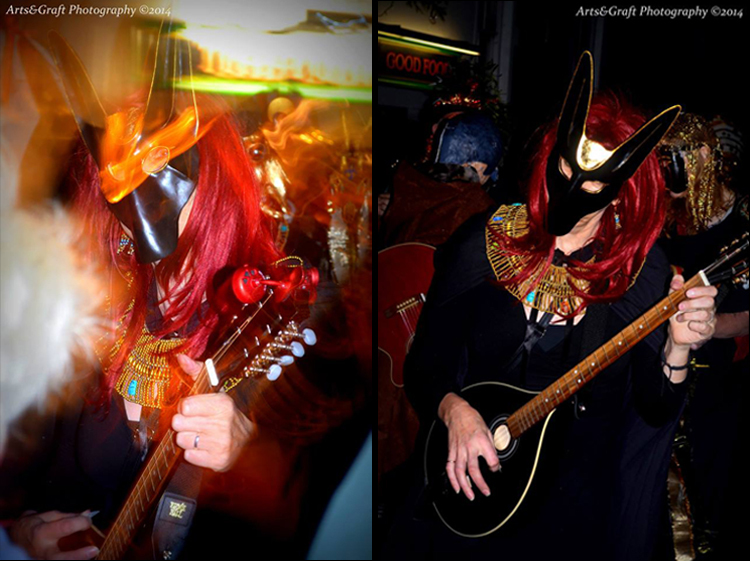 We are named The ‘Gyptians after the famous and iconic ‘Egyptian House’ in Chapel Street which is the Guild’s ‘home’. 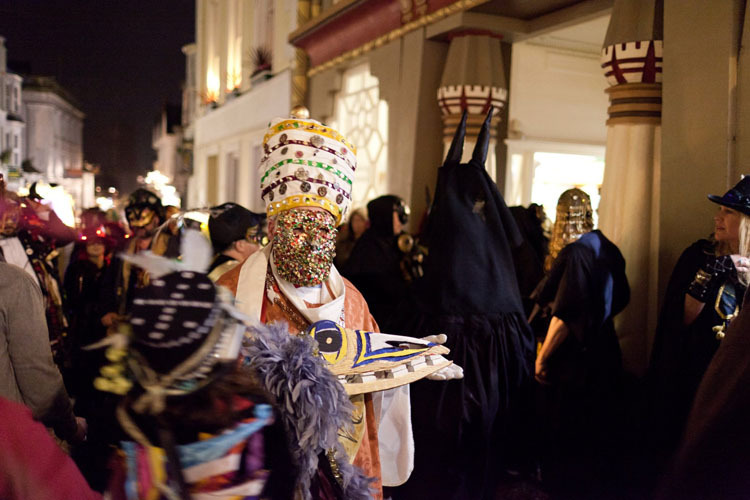 It is both a ‘Processional Guize’ and a ‘Visit Guize’ in that the Guild performs both processionally through the streets as well as visiting various public houses to perform musically, to bring a blessing (or to bring down ancient Egyptian curses upon those who upset the Guild…) and of course, to partake of the establishment’s drinks. 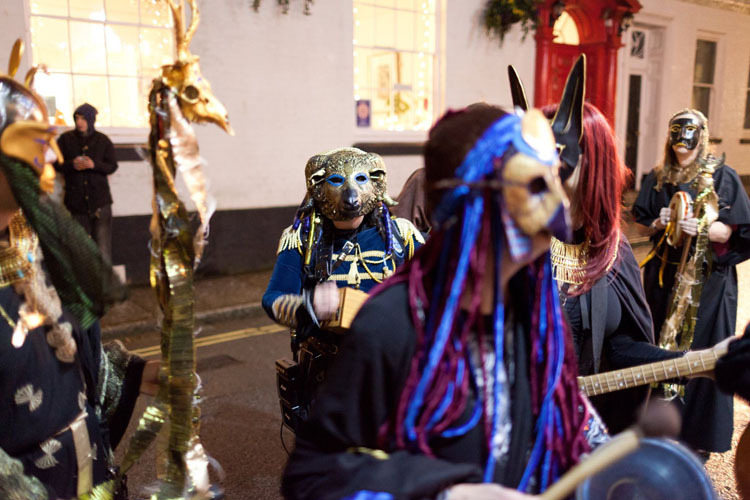 In both processional and visit performances, the Guild is accompanied by its very own and much loved Guize Beast; the wild and anarchic ‘Ramesses’ draped in black and bearing the gilded skull of a young ram found washed up on a Hebridean shore. 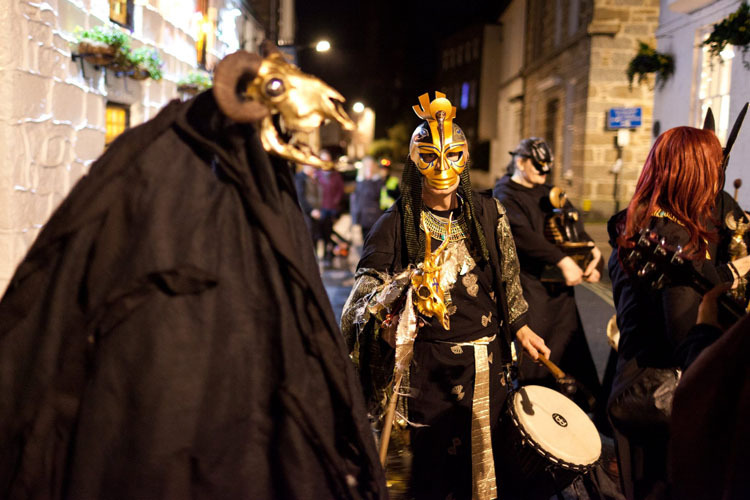 In addition to performing with the Guild, I am also the ‘rider’ of the Montol Beast or ‘Oss Kasek Nos, guided through the streets by the ‘Teazer’ performed by Zoe Young. 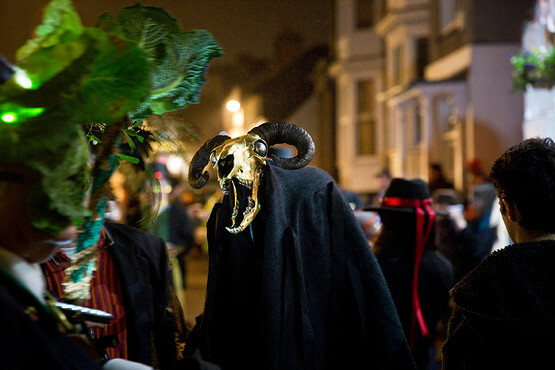 Kasek Nos, formed from a mare skull and draped in ghostly grey tatters, can be seen in Montol’s late night procession when the ‘Oss is ceremonially summoned from the famous ‘Admiral Benbow’ pub to follow the procession down towards the seafront to perform in the ceremony of ‘Chalking the Mock’. Here, a member of the public is chosen at random by Kasek Nos. 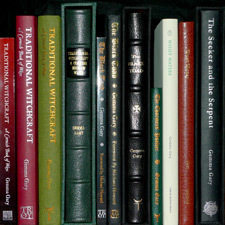 The chosen ’victim’ then chalks a rough ‘stick figure’ on the ‘Mock’ which is the Cornish version of the Yule log. 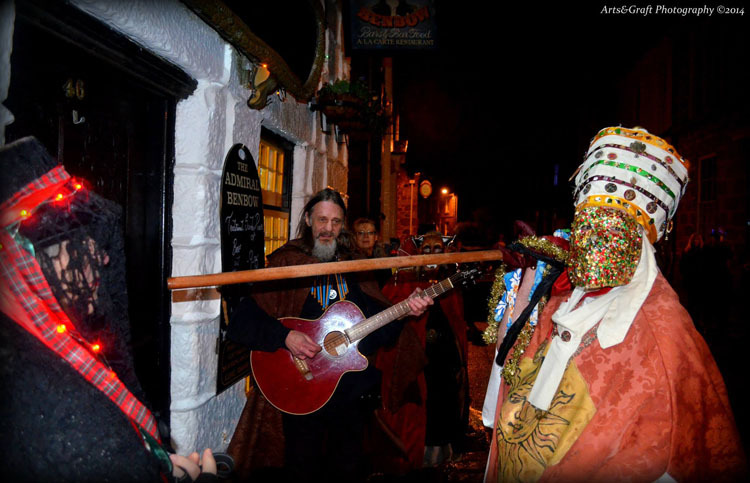 The Lord of Misrule announces to the crowd ‘According to our tradition this represents the end of the old and the beginning of the new!’ before the Mock is put onto the ceremonial fire. The Above images have been gathered from various places. With thanks to Arts & Craft Photography and Andrew Brown. Thank you to all other photographers. If your photography is on this page, please let me know so I may credit you or remove your image as per your wishes.